By all accounts, Sidney Crosby has had a life-long love affair with hockey. Stories abound of Sidney as young as age two being able to hold a stick properly while hitting a tennis ball. At age ten he scored an incredible 159 goals in 55 games playing hockey in his hometown of Cole Harbour, Nova Scotia. He had a season point total of 280 points. While at Shattuck- Saint Mary’s Prep School in Minnesota, Sidney set new scoring records by getting 72 goals and 110 assists for a total of 182 points in just 57 games. He was also the only player under the age of eighteen to play in the Canadian Junior Hockey tournament and the youngest to ever score a goal in the championship. 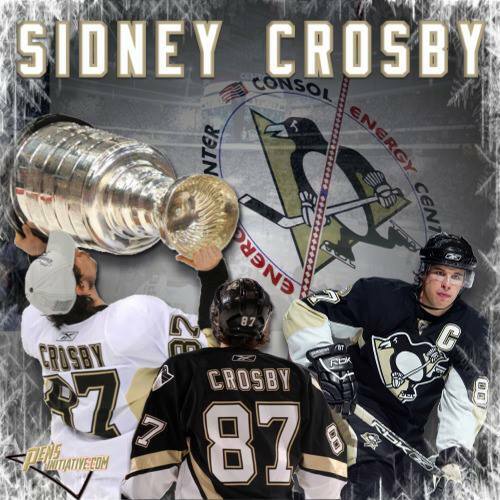 By the 2004-2005 season, Crosby was considered the best hockey prospect in the world. His list of awards is too numerous to detail but include: Art Ross Trophy 2007, Lester B. Pearson Award/Ted Lindsay Award 2007 & 2013, Hart Memorial Trophy 2007, Maurice "Rocket" Richard Trophy 2010, Mark Messier Leadership Award 2007 & 2010, and the Stanley Cup 2009. Sidney has been a star on the international stage as well. Crosby scored the winning goal in overtime against the United States in the Olympic gold medal game in 2010. Crosby is a poised captain who is an articulate spokesman not only for the Pens but all of hockey. He has suffered 2 major injuries in the past two seasons but faced each recovery with drive and determination to return to his place at the front of the pack. His mental toughness is surpassed only by hockey aptitude. He sees the ice and understands the ins and outs of the game like no other. He has otherworldly puck handling skills and can score from anywhere on the ice including while lying on his back. He has that rare ability to let the flow of the game determine his next move. He elevates the game of anyone lucky enough to play on his line as evidenced by the remarkable 2013 season of Pascal Dupuis and Chris Kunitz. Sid is very community-minded and philanthropic. Crosby and the Pens sponsor Sidney Crosby’s Little Penguins. One thousand kids, aged 4 to 8, have every season for the past four years received full hockey equipment paid for by the Pittsburgh Penguins, their 25-year-old captain and several sponsors. He also established the Sidney Crosby Foundation. The Foundation, created in his home province of Nova Scotia in 2009, is committed to providing financial support to charities that are beneficial to the community as a whole, specifically charities benefiting children. Sidney Crosby is a bright, talented and hard working. He's our articulate captain and today, on his birthday, we honor him.